Nearly two years ago four factors were influencing the energy market and specifically the price of oil. 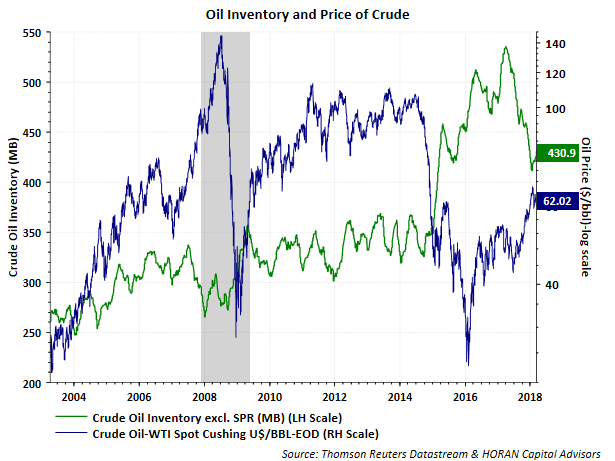 The fact oil inventory spiked is partially attributable to technological advancement in drilling and specifically, increased supply from fracking activity. The subsequent low level of drilling activity that began a few years ago contributed to the supply decline. 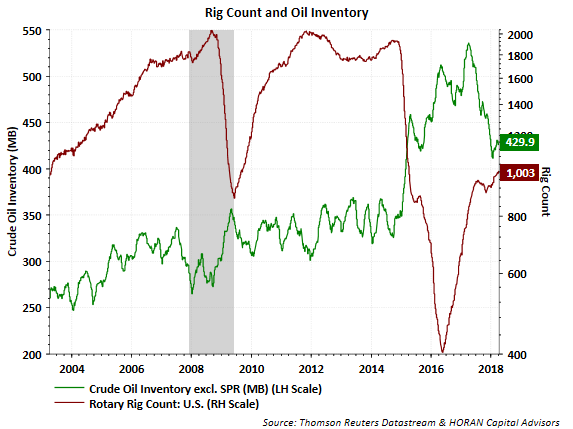 Today, the rig count has once again moved higher and the oil market may be seeing a potential bottoming of the supply decline, yet oil prices continue to move higher as seen in the second chart below. At the same time oil prices and rig count bottomed, US Dollar strength peaked as measured by the trade weight value of the Dollar and seen in the below chart. Movement in the Dollar influences a number of various investments with more on that topic in the article, Yes, the U.S. Dollar is at a Critical Juncture. As it relates to oil though, there is an inverse correlation between the Dollar and the price of oil. 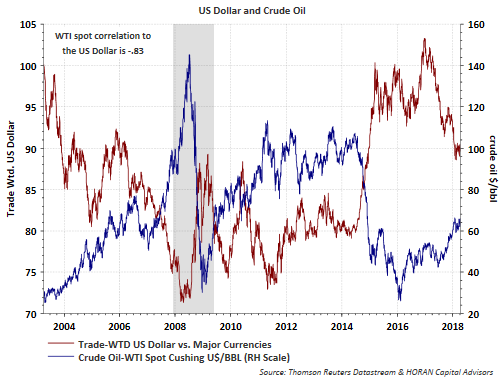 So as the Dollar weakens or declines, which has been the case since late 2016, oil prices move in the opposite direction or increase. The below chart shows this correlation to equal -.83. I have written about the Dollar’s impact on commodities in various interest rate environments in the past with one article, Interest Rate Policy To Impact The Dollar And Commodity Related Industries, maybe of reader interest. Currency moves are difficult to predict, but as noted in the critical juncture Dollar article linked to in the earlier paragraph, the US Dollar seems to be at or nearing that critical juncture. Investors paying attention to the Dollar’s next move are likely to gain insight into potential investment opportunities or maybe areas to avoid. A Balancing Oil Market But Will It Last?